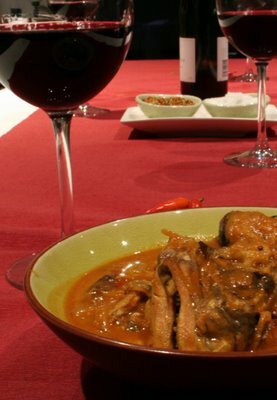 Rich Maha specialises in Malaysian, Indian and Sri-Lankan fare from their bain-marie and ala carte menu. Although they have delicious hawker-style offerings, the real attraction for my family has always been the fish head curry for take-away from either the Vermont South or Hawthorn restaurants. 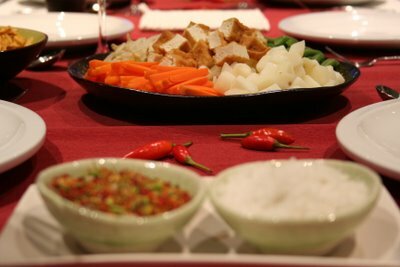 We would order it, bring a pot for them to fill then take it home to enjoy (read on to discover why). Discovering that they opened a CBD branch just a few weeks back, I immediately contacted some like-minded friends for a Fish Head Curry night and the responses were fast and furious, mostly with comments like "Yum - count us in!". To cater for my vegetarian friend, I made a mild dahl and gado-gado. 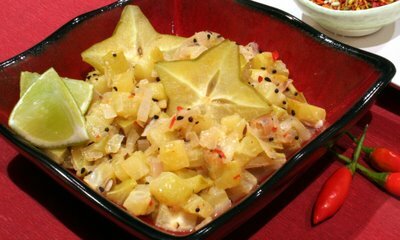 I also made the star fruit chutney from Mangoes and Curry Leaves by Alford & Duguig. I love the presentation of this side dish and the flavour certainly complements the spiciness of the curry. ..makes me yearning for a plate of fish head curry dip into the roti right now....yummm..
you're right, it is Equitable Place. I knew it didn't sound right when I was typing it. I suggest that you pre-order if you need to serve say 4 - 6 (as we did). Of course, they have their own take-away containers but if you bring a pot, the fish heads fit more easily (which prob means that you get more!). Thanks! I actually managed to find that place before reading your reply. Sarah, so he made it on the spot for you? I figured that it would require some simmering, unless he already had the sauce just not the fish bones... I think the sauce is the best part anyways myself. do you have a blog as well? Yeap, he made it on the spot while I waited for a bit. I am guessing he already has the sauce as well. He probably couldn't make the fish head because they were frozen. But that's fine cause I too think the sauce's the best part. I had no idea it was so good! I live about a 10 minute walk from the Vermont South restaurant but have never been...Methinks I should place more stock in my local eateries! A collection of culinary adventures and discoveries.